Dimensions 590'7" x 68'2" x 23'3"
Originally designed with only a single hanger, the Navy doubled her aircraft stowage requirement to 48 aircraft in order to give her a more useful air group. This necessited the addition of a second hanger atop the first. Coupled with the vessel's light displacement and narrow beam, the end result produces an unacceptable degree of instability in rough seas despite being fitted with Sperry gyro-stabilization. 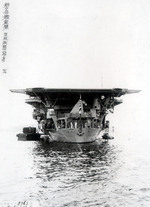 No Island is installed; her navigating and control bridge is located just under the forward lip of the flight deck in a long glassed-in "greenhouse". Her hanger box is set back 23 m (75 ft) from the ship's stem, giving the carrier a distinctive open bow. Her 156 m (512 ft) flight deck is extended well beyond the aft end of the hangers and is supported by twin steel pillars. Six transverse arrester wires are installed on the flight deck. Two elevators service the upper and lower hangers and connect them with the flight deck. The boiler uptakes are trunked to the ship's starboard side, approximately amidships, and exhausted horizontally just below flight deck level through two small horizontal funnels, the ends of which are supported by heavy bracing. As completed, her primary AA armament consists of six 12.7-cm (5.0")/40 Type 89 gun mounts, three on either side of the carrier's hull. Six-quad Type 93 13.2 mm MGs mounts completes her armament. General Layout. Note aft position of rear elevator and hangar arrangements. In June-September 1933 RYUJO undergoes sea trials and training exercises for her air group consisting of 9 Mitsubishi Type 13 B1M2 (+3 spares) attack aircraft and 3 Nakajima Type 3 (+2 spares) A1N1 fighters. A maximum speed of 29 knots is achieved but the vessel is deemed very wet under moderate sea conditions due to much shipping water by the bows and a general lack of stability. Because of this and findings made from the inquiry to the disaster to torpedo boat TOMOZURU on 12 March 1934, on 26 May 1934 RYUJO enters dock at Kure Naval Yard for a refit and extensive modifications to address stability problems. Changes include strengthening of the keel, addition of ballast keel, addition of enlarged bulges to either side of the hull and the removal of the aft two-twin 12.7-cm AA gun mountings to reduce top weight. Those are replaced at the same location by two-twin Type 96 25 mm AA guns mountings. The flight deck is also widened between the forward 12.7-cm (5.0")/40 Type 89 gun mounts and the forward elevator. The funnels are moved up the hull side and now are curving downward; the forward funnel is also enlarged. Those modifications serve to keep the flight deck clear of smoke and fumes. On 20 August 1934 the refit is completed. Displacement is increased to 10,600-ton standard. Undocked. For just over a year things remained as they were, but on 25 September 1935 the RYUJO among other ships was notably damaged in the "Fourth Fleet Incident" by a typhoon that struck during fleet exercises. Light carriers RYUJO and HOSHO, several cruisers and destroyers suffer damage to their flight decks and superstructure, RYUJO also suffers the flooding of its hangar. The bridge area is heavily buckled and dished in below the windows. 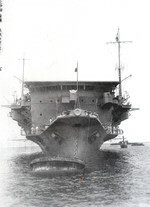 To incorporate the lessons learned from the "Fourth Fleet Incident", on 11 October 1935 RYUJO enters dock at Kure Naval yard for repairs and refit. Reduced to a reserve ship class status. During the next seven months alterations are made to improve the ship's seaworthiness. The carrier's distinctive low forecastle is raised one deck higher by 3.1 m (10 ft) and some flair added to prevent shipping waters in heavy seas. The arrester wires are modernized to stop a 6,000-kg (13,000 lb) aircraft. RYUJO's bridge and front flight deck are rounded; this modification shortens the flight deck by 2 m (6.5 ft). On 31 May 1936 the refit is completed and the carrier undocked. 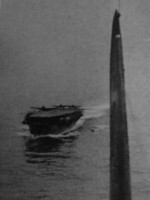 During the summer from June to August 1936 the carrier undergoes sea trials that confirm a definite improvement on seaworthiness in light and moderate sea conditions. 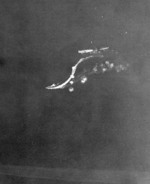 Others trials are undertaken regarding bomb-diving tactics with 12 (+4 spares) Aichi Type 94 D1A "Susie" carrier-bombers. The latter are also deemed satisfactory. Her aircraft complement also consists of 24 (+8 spares) Nakajima A4N1 fighters. The Japanese are then satisfied, and RYUJO returns to active duty in September 1936 as flagship of Rear Admiral (later Vice Admiral) Sato Saburo's (34) CarDiv 1 with light carrier HOSHO. Her aircraft complement consists of Yokosuka Type 92 B3Y1 attack planes, Aichi Type 94 D1A1 "Susie" carrier-bombers and Nakajima Type 90 A2N1 fighters due to shortage of the A4N1 version. On 15 November 1939 arrives at Kure, wheupon RYUJO is reduced to reserve ship status. Starting in December and lasting through January 1940 the carrier undergoes various repairs and a reshaping of her flight deck which narrows it back to the original width between the forward 12.7-cm (5.0”)/40 Type 89 gun mounts and the forward elevator. On 28 April 1942 enters Kure Naval Base’s drydock for maintenance and refit. It appears RYUJO now received an AA upgrade. Though some sources state that RYUJO's light AA armament was altered at the outbreak of the war, given her schedule, May 1942 seems more likely for when RYUJO’s light AA six-quad Type 93 13.2 mm MGs are probably replaced by six-triple Type 96 25mm guns. She retains amidships her two-twin Type 96 25 mm guns.